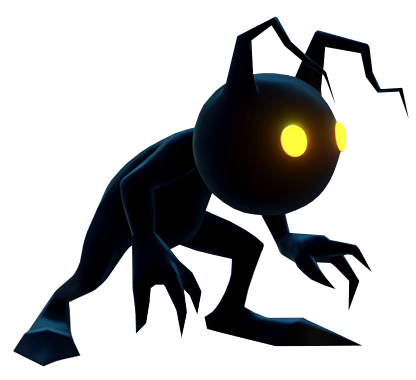 The Heartless are a dangerous enemy that plague the ocean of worlds. Throughout his adventure, Sora discovers many different types of enemies that stand in his path, those that sought the hearts of all in order to feed the darkness. These shifty shades skulk around, then strike out of the blue. Stay locked on to make sure they don't give you the slip. They're immune to normal attacks when they dive beneath the surface, but a splash of Water magic will yank them out of hiding in a hurry! These souped-up Shadows hit hard and fast with their jump attacks; if they're in the air, better get out of there. Once they melt into the ground, they're beyond the reach of most attacks, but that's nothing a little Water magic can't fix. Fight puddles with puddles! Your best bet against these feather-flinging dive-bombers is a blast of magic to keep them still just long enough to lay down some hits. If they drop to the floor, get ready for a nasty spinning charge attack. Jump over it and watch them go sailing past. Keep an eye on the sky when you're out and about; they like to perch on tree branches and other high spots to get the drop on prey. Make snuffing out othese flame-flinging fiends a top priority, or you're toast! And whoever said to fight fire with fire never met these things; your red-hot spells won't even tickle. When in danger, they'll burst into flames and really bring the heat. Douse them with a well-aimed Water or Blizzard spell to chill them out, then finish the job. Hit these sopping scoundrels while they're coated in water and they'll only teleport away. That's your cue to bring the magical heat; a Fire spell will evaporate that shield in no time. Don't get caught out in their rain, or you'll come down with the extremely annoying cloud status. If you want to rock these baddies' world, aim for the face; their pointy posteriors will only deflect your blows. Physical attacks will pass through them when they sand-travel, but spells still hit home, so mash that magic! When they gather sand and grow enormous, a Goofy Bombardier will cut them down to size in no time. These dastardly dual-wielders are like blenders on roller skates, except worse. You can try to keep your distance, but they'll soon close in on you, or else just huck a fireball your way. Be careful attacking when their blades are crossed; that means they're ready to counter. Stay cool, bide your time, then strike when they drop their guard. As threats go, these aren't all that threatening, but that's no reason to be reckless. Just be careful not to get surrounded. Focus on taking them down one by one! These are more or less just like vanilla Soldiers, except way angrier. A Soldier in flight is no caught for fright; just watch for that charging attack and you'll be all right. When they fly out of walloping range, a blast of magic will do the trick. Don't get bodychecked by these oversized oafs, and watch out for the shock waves when they come down from a jump. Their jelly bellies will bounce any frontal attacks, so circle around to the rear before slashing away. Magic works, too. Get on their nerves, and they'll turn red and charge at you. A Blizzard spell ought to cool them off. Basically your garden-variety Large Body...if your garden is full of extra-aggressive monsters (which would raise more questions than it answers, really). These fiery fliers come to a midair halt and conjure up a sigil before they launch flaming badness at you. Use that opportunity to strike! When they do start dishing out the rapid-fire spells, keep a cool head and dodge out of the way. Nothing rains on their parade quiet like a cool sip of Water magic. If you've got the MP to spare, go ahead and make a splash! These watery wizards swim through the air with the grace of the majestic trout. Before casting magic, they'll come to a stop and summon spheres of water, leaving themselves open to attack. Think fast if they do start conjuring, becasue the speed of their spells is no joke! Nothing dries them up faster than a zap of Thunder magic. If you've got the MP to spare, use it to give 'em a thousand-volt jolt! These electrical enemies zip through the air and zap you. They have to stop and conjure up a sigil before they can rain lightning down on you, so take that chance to exact brutal prevenge. Their rapid-fire thunderstorm will electrify you if it connects, so watch for the tell and don't get too close. Aero magic will have them winded in no time flat. If you've got the MP to spare, start flinging those gales! These blustery baddies dance and whirl on the wind, but can't use magic without stopping to summon their sigil first. That's your cue to blow 'em away. If you see wind gathering at your feet, move away—fast. Unless you like getting swept up in a tornado, that is. Nothing freezes them in their tracks quite like Blizzard magic. If you've got the MP to spare, use it to put them on ice! Keep your wits about you when walking past pottery; you never know when it might sprout fuzzy limbs and attack! Once these scaredy-cats show themselves, they'll start running around like crazy. If you try to create some distance, they'll huck smaller pots your way, but a well-timed block will return those to sender. Popcats are top-heavy and prone to face-planting. When they stumble, make sure it's the last trip they take. Smash these green Popcats to get at the bounty of HP prizes inside. Refreshing! Smash these blue Popcats to get at the bounty of MP prizes inside. Energizing! Smash these red Popcats to get at the bounty of Focus prizes inside. Invigorating! Smash these gold Popcats to get at the mountain of munnies inside. Score! Archers that shoot arrows from their bows. Sound obvious? Well, that's honestly all these is to 'em. They pose little threat to you alone, but in packs, they're a problem. Return fire from afar with magic, or close the distance and introduce them to your Keyblade. They'll sometimes team up with Air Soldiers. Maybe they're buddies? Think this massive, musclebound monster's a slowpoke? Think again. Think it's no big deal when it stops swinging around that huge axe and wears it as a mask? Think again...AGAIN! Just keep swinging. You may not be able to damage the big guy while he's masked, but you can break his fancy face. Imagine a Rock Troll that's always hangry. Yep, that's this guy. Aside from a mean punch, the biggest threat from these bullies is their stampede attack. They always lower their visor before trying to ram you. If you can break the horns off those helms, you'll get the rest of the fight "free of charge." In formation, they're tougher to wrangle. Either break their ranks with a Trinity Guard, or keep your distance and pepper them with magic. Face it: some Satyrs are haters, and this is what they look like. Those jet packs and ray guns may be toys, but these "masked intruders" are anything but fun and games when they come barreling your way. They'll sometimes chuck grenades your way, but that's not necessarily bad news. After letting it fly, they'll hit the deck. Kick 'em while they're down! Or, if you're feeling fancy, a well-timed Keyblade swing will return those grenades to sender. Approach these turrets and they'll only warp away, so your best bet is to return fire from a distance with magic. The extending arm mount allows them a variety of firing positions. Silver lining? You'll look awesome swinging around that pole! This puppet may not seem like such a pain when it rides around on its ring, but just wait until it possesses a nearby toy! Or, here's a better plan: don't wait until it possesses a nearby toy. Sever this scoundrel's strings on sight. These impish chimps swing through the trees and scrabble along walls while pelting you with nuts. Rude! Block whatever they throw and send it right back at 'em. They'll taunt and tease and try to bait you into attacking. The best response? Attack! They're wide open the whole time, silly monkeys. Part shovel, part pogo stick, part drill—and thankfully, all pretty clumsy. Stay calm and sidestep its attacks, especially the pounch; whiffing that one leaves this Heartless flat on its face and wide open. Most of the time, its shovel will dig up rocks to sling your way, but once in a blue moon it'll hit a mother lode of prizes—all yours for the taking! The prettiest roses have the cruelest thorns—or, in this case, laser parasols and spinning skirts of doom. At distance or up close, they're not a threat to be taken lightly. Watch for the flash after they've opened their parasols; that's a sure sign you're about to eat beam. The good news is that blasting that laser takes these ladies temporarily out of commission. Use that time to make it a permanent retirement! These fluffians can fling their spores into the air to create Puffballs. Eventually, their own fluff will grow back, but that's nothing a gust of Aero magic won't fix. Keep clear of the pollen they send up, or you'll come down with an annoying fit of sneezing. These wicked weedlings may look cute romping and rolling around, but make no mistake; they will bring the hurt if you let them. Defensive driving is a foreign concept to these careening carts. Even if you take out the horse pulling them, another one will sprout to take its place. If any Powerwilds are around, these carts will stack up into a turret where the Powerwilds can rain pain down on you. Swat the simians before they can make with the monkey business! A buck that chucks ice as it leaps and bounds. Fire magic will blast those frosty antlers clean off, making the fight a lot easier. Just don't go slinging Blizzard spells at it, or that rack will come back! A skeletal serpent, soaring on wings of snowpack. With a simple spin of its body, it gives rise to icy whirlwinds that gnash and rend all before it. Sound imposing? Bust those wings and it's just a snake with arms. That doesn't mean it's entirely toothless on the ground; it can still burrow beneath Sora and his buddies and stab its tail upward. When you see it dive, look alive! These flying fiends will dart at you with guns blazing, but they can only attack head-on. Turns out, shooting too straight is a weakness! They may be easy to dodge, but they're not easy to hit. Don't hold back with that magic! If it's blue, Thunder hits true. If it's red, Blizzard instead. If it's yellow...something something Fire? Keep blasting them with their elemental weakness and they'll go belly-up in no time. This swashbuckler's anchor can hook onto thin air, turning it into a swinging pendulum of pain. Don't watch the anchor, though; it's that extending chain and sharp saber you need to be ready for. Instead of trying to keep up with it, try letting your magic do the chasing for you. One monster, two modes, all trouble. In their aerial form, they'll flit about on blade-wings, slashing at you whenever they get the chance. In their ground form, they'll lob rockets your way. Watch the target on the ground: when it turns red, that's your cue to bail! A colossal Heartless that arose before Sora in a land of endless sea and sky. It looks different from other Darksides Sora has battled with, but the cause remains a mystery. A dark swarm of Shadows, gathered into a massive, seething cloud. The fact that its foul ilk has been seen not just in the realm of darkness but in the realm of light is surely a harbinger of some coming evil. A dark swarm of Shadows, stacked into a looming spire. A colossal Heartless that Young Xehanort summoned to stall Sora and his pals in Toy Box. This thing comes with everything. Annoying force field? Check. Hailstorm of missiles? Check. Ridiculously huge tornado that flings around all nearby toys in the area? Yup, that's a check. As toys go? Not much fun. Mother Gothel's fall to darkness gave rise to this gargantuan Heartless, and it's even crueler than she was—which is saying something. A lupine Heartless that rose from the darkness consuming Hans's heart. Wolves hunt in packs, and this monstrosity was no exception: it summoned a horde of phantom packmates, and transformed into a darkness so vast it blotted out the entire sky. Freshly escaped from Davy Jones' Locker, Sora, Jack and the others were all set to celebrate...until this oversized wet blanket on wings flapped in to ruin the moment. I suppose an epic air skirmish high above the Black Pearl was one way to mark the occasion. A piscine horror lurking beneath the crystal waves of The Caribbean. A shape-shifting swarm of nasty bots that terrorized the streets of San Fransokyo. If Hiro hadn't pinpointed the location of the core unit controlling the rest, these baleful boxes might have spelled the end for Sora and Big Hero 6. This haunting horror held the hearts of Sora's friends hostage. Time and again, Sora fought it back, but with each hard-won victory, it would simply slough its form and depart to another world. Its broad arsenal of magic made it a formidable foe to face alone, but in the end no Heartless could match the strength of Sora's resolve. What's worse than a Heartless? Try three of them, fused into one weird body. Stomping feet and gnashing teeth, an active volcano spewing fire, plus a thundercloud tail raining lightning bolts left and right added up to one bad day in San Fransokyo. This regal flan is pure mischief, with two cherries on top. It was last seen touring Thebes and generally getting in the way of the efforts to rebuild. This regal flan is pure mischief—now in strawberry! It was last seen failing to play well with others. Take its toys away and put it in time-out for good! This regal flan is pure mischief, served with a refreshing citrus twist. It was last seen enjoying a lovely picnic in the woods. Take some pictures to help it mark the occasion! This regal flan is pure mischief, and completely bananas besides. It was last seen door-hopping through a certain world. Give it the perfect souvenir: a Keyblade right to the jiggle! This regal flan is pure mischief, and the grapes adorning it are probably sour. It was last seen playing in the snow...but it's cold out, so just hurry up and defeat it. This regal flan is pure mischief. The melon on its crown? Also evil. This regal flan is pure mischief, even if the watermelon on its crown does look delicious. What nefarious scheme is it hatching in that fortress? Does it really matter? You've got some cannons. Fire away!